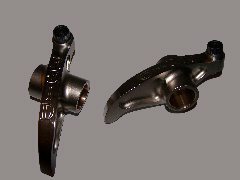 REID ROCKER ARMS have been painstakingly developing and designing with the most advanced software available in the industry. They take great pride in knowing each one of their components are geometrically perfect and engineered to the highest standards of production. Pushrod oiling through the adjusting screw. Chrome moly steel, heat treated to resist fatigue without brittleness. REID original I-Beam construction for minimum deflection. Completely New Design in 2007, not a copy with a new name. Fully CNC machined from billet stock. Developed and engineered with state of the art CAD software. Extensively reviewed for strength and durability with F.E.A. (Finite Element Analysis). Modeled into a complete assembly to ensure correct geometry. Several manufacturing methods incorporated that will insure quality of the finished product and correct ratio of the completed component. This rocker has run in a professional top fuel team for over 400 runs!